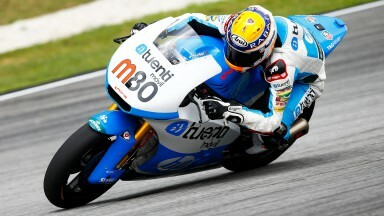 Tito Rabat was quickest as the first drops of rain were deposited on the Sepang International Circuit during opening Moto2™ practice on Friday morning. It was a Tuenti HP 40 one-two result, with Pol Espargaro second from Interwetten Paddock Moto2 Racing’s Tom Luthi, while championship leader Scott Redding finished 12th for Marc VDS Racing Team. The leading lap time came in the form of 2’08.053, with Rabat a comfortable four tenths of a second quicker than Espargaro. For Redding, it was a slower start to the weekend as the taller rider struggled for top speed on Sepang’s typically long straights; the Englishman (ahead of Espargaro in the standings by 20 points) ended the opening period 1.2 seconds off the pace. A light shower affected some parts of the track in the opening stages, although it wasn’t until the closing minutes of the session until there were falls for the likes of Rafid Topan Sucipto (QMMF Racing Team) and Johann Zarco (Came Iodaracing Project). 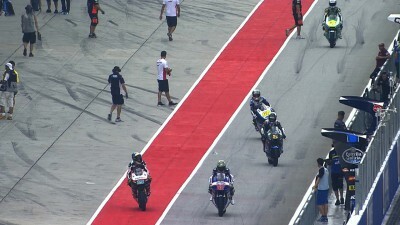 Both riders walked away and, in the case of the latter, there was still a top ten finish when proceedings ended. The next Moto2™ action will come with second practice from 3:05pm local time (GMT +8).